Observing the events of the past few weeks, with a sharp focus on the two most critical ones - the passage of the Food Security Bill 2013, and the dip in Indian GDP growth rate (first quarter) - I realise that these two events will ensure that the Indian economy stands redefined in a fundamental way. I clarify that my personal conviction is all for food security for those who really need it, but not at the cost of taking a huge risk with the fundamental economics of the whole nation, which includes people who do not need it (the food security as promised). To set the background right - I am very proud of Indian agriculture. Despite so many hurdles, India is the biggest producer of milk and pulses in the world, and leads in at least 10 other areas substantially. We have world-class research institutes, and sincere scientists, politicians and farmers. Let me now list the reasons I feel that the Indian economy has been redefined. Issue 1. The successful passage of the Food Security Bill 2013 This clearly implies a huge change in the way the agricultural economy in India works. And since more than 50% of people depend on it for their direct incomes, that's profound. Even more significant is the fact that 67% of Indian population will be directly covered by the handouts of this Bill's promise. The HUGE promises made in the Bill require massive procurement of foodgrains (wheat, rice, coarse cereals) which means our farmers need to work really hard to produce more (since imports are ruled out). Given the extremely low productivity of agriculture in India, this means that in a few months or years from now, the strains will start showing. The table clearly highlights the structural problem with Indian farm productivity. Majority of the farmers are stuck with very small landholdings due to social, personal and family reasons. Consolidation is the crying need of the hour, but since that entails huge social readjustments, I do not see that happening quickly. Maybe in another 10 - 20 years, but not now. Grow more wheat, more rice and more coarse cereals is the implicit message in the new law to all farmers of India. Since these will be procured preferentially by the massive market operations of the Food Corporation of India (FCI), why bother with growing vegetables? Hence, erratic patterns of vegetable production are a clear possibility. That means major inflationary push, as vegetables are a key component in the WPI basket of foodgrains. The fact remains that in the coming years, the government may include suggestions like the ones from Indian green revolution's father Dr Swaminathan about making this food security a true 'nutrition security'. That will pump up the bill even higher, unfortunately (as pulses may get included, though unlikely). 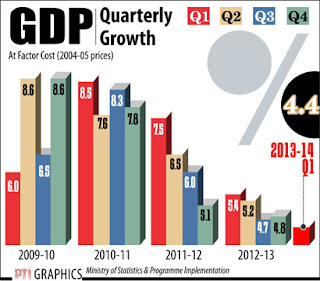 '7% plus annual GDP growth rate guaranteed' period is gone forever. Fuelled in no insignificant part by large global fund flows courtesy easy monetary policies of Western central banks, India enjoyed while the fun lasted. Now, we really need to work hard at the basics to get to that level of growth. And what does that mean? Improving the productivity of an average Indian, which means, among many things, less holidays, more working hours per day, less talking, more skilling, and so on. All these are remote near-term possibilities (the poor quantitative results of 5 years of the well-funded National Skills Development Council's efforts are well-known, and even accepted on the 15th August by the PM from the Red Fort). So when GDP is not going to grow fast, where are the huge revenues that the central government needs to run the Food Security commitments? Since the commitments made under the Food Security bill HAVE to be fulfilled always now - there is no sunset clause, and no government dare take on 67% of the population of 1.2 billion (and growing) - this means that heavy borrowing or heavy printing of currency will happen sooner than later. Both will imply massive inflation in the short and medium term. That inflation will hurt everyone - even the poor. Foreign investors will be badly spooked as Indian government will be forced - at times - to cut development spending to fund food security commitments. And I am not even talking about the 25% leakage through PDS that everyone tacitly acknowledges will happen anyway. If I am an honest tax-payer who likes to save, I will be penalised heavily in the coming years and decades. Inflation will keep eating into my savings, even as costlier food items will make me realise the folly of not being born poor in India where 67%, in one shot, got state coverage. This will be gallows humour every morning when I start for work. Not motivating. 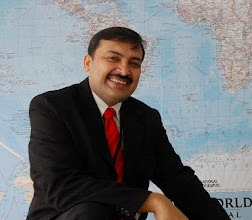 All these years, I always believed that the only long term solution to making India a great nation was to motivate Indians in every sector to work harder, produce more, import less, export more, be dignified by not asking for doles and 'backward status' (that everyone seems to be wanting now), and by focussing strongly on our defence. It seems that I am wrong somewhere in these beliefs. To all young people reading this, get set for a few decades of gut-wrenching change in the way our economy works. Monetary policy as the RBI knows it will become less and less effective. Fiscal interventions by the central government will get severely constrained as more than 10% of all revenue receipts get absorbed instantly in one big programme. Not the RBI, not the Ministry of Agriculture, not any government will be able to control it the way a holistic approach would require. Simply because the commitments under the new Bill are so heavy, and the Indian GDP is not going to grow very rapidly, we will see massive readjustments in all aspects of our economy. Tighten your seat-belts, ladies and gentlemen! WILL THERE BE NO CORRUPTION IN IT ??? The answer depends upon government(hope for the best). Inorder to make it success the key thing will be “productivity” . This gives a huge responsibility to the farmers .As America solved its problem of productivity. If India could do that way it would lead to huge success of FSB, but here it looks difficult or impossible. As the bill gives the message about grow more rice ,wheat ,coarse cereals . It would make farmers to concentrate on these crops. This would directly affect the vegetable market and ofcourse these are unpredictable. According to Dr.Swaminathan FSB does not focus on “productivity” and “nutritional growth” .Which is a major criticism of this bill. The message is very clear for the youth by the shrinking GDP that there will be more fall in the GDP and more struggle for the youth(for jobs,etc).They need to produce productivity. Hence, respected Sir , I completely agree on the redefinition of the Indian economy.